I had to preach at the chapel service at the Myanmar Institute of Theology today. Here is the note I wrote for it. It was raining heavily outside. I was on a bus on the way back home from downtown. When I got off the bus, it was still raining and I didn't have my umbrella with me. I thought "Well, I should wait at the teashop for the rain to stop." I went into a teashop near the bus stop. Sitting in the teashop, I finally had a chance to do some thinking. First of all, it was by chance that the rain started right after I got off the bus. It wasn't planned either that I would go into the teashop to get shelter from the rain. It was just a coincidence. Accidents happen all the time in our lives. I had a car accident. Accidents happened and we broke our legs while playing football, right? Coincidence is just like events that happen at the same time by accident. Even in history, a lot of great things have come out because of accidents. Alexander Fleming discovered Penicillin because of an accident. Besides, think of Isaac Newton. He thought out the law of gravity because an apple fell onto the ground. A cartoon said he was able to figure out the law of gravity because it was an apple that fell on his head. An apple! If it were a fruit from the tree in front of our house that fell on his head, he would be dead before he could write up the law of gravity. You know what that fruit is? It's Durian. It has all the prickly rinds. Therefore, Newton would probably be dead if it were Durian that fell on his head. Anyway, this example taught us a lot. In addition, accidents, coincidences and small things later tend to become important in our lives. Accidents will happen in our lives. We just can't avoid them. Small things that we wouldn't even notice might have some big impacts on somebody else's lives. Moreover, I would like to tell you one example. It was six years ago. I was about 20 something at that time. I had to speak at a church in Michigan. It was like a month after I got to the States. I was so scared and nervous. My listening skill was great. But my speaking skill? It was lousy. 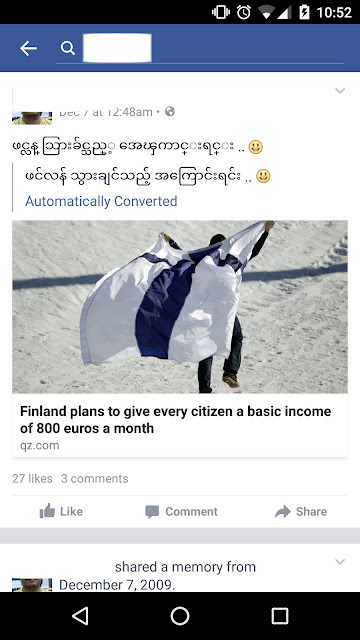 Even in Burmese, let alone in English. I think I did quiteÂ a lousy job that Sunday. But after the service, an old lady came to me and said "Lwin, wonderful, you were doing a great job!" You know how much it had helped me at that time. I was afraid to speak. But after that, I wasn't afraid any more. I spoke again and again and again. I still do a lousy job but I am getting better. J J What I am getting at is that small and kind gesture from the old lady has helped me move on. That's how a small thing has done to somebody's lives in a good and positive way. However, there can also be negative things. To illustrate that, I would like to tell you another story of my own. I usually walked home after my classes at the Myanmar Institute of Theology. The buses were usually crowded. I chose to walk for exercise and for doing deep thinking while walking. One night, it was really dark because there was no electricity. About half way home, I stepped on a frog and it was dead. I thought to myself. Well, I didn't mean to step on that frog. Yet, it was dead. Was if my fault? Or was it its fault? I don't think it was mine because I didn't mean to kill it and I didn't mean to step on it. I just didn't see it because it was dark. It was just an accident but I killed the frog. It had a big impact on the frog's life. Do it with love for God. Do it with love for yourself. In conclusion, please remember accidents will happen. It will lead to positives or negatives. Yet, please do everything in love. I read this news today.